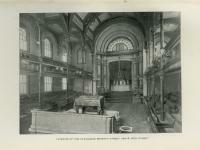 The Historical Society of Pennsylvania's collections include a large number of resources that relate to the Jewish community in Philadelphia and beyond, dating from the earliest colonists into the twentieth century. Resources include published materials, manuscript collections, newspapers and other periodicals, photographs, and other graphics. To learn more about the Society's holdings, search our online catalog  for "Jewish", "Jew", "Ashkenazic" or "Sephardic". You should also search for family names, synagogue names, town or territory names, or other locations and landmarks that may provide insights into your family history. Keep in mind that some materials may be in Yiddish, German or other languages. Also remember that some foreign words can be Anglicized in different ways; you may want to search for alternate spellings. Descriptions of all manuscript collections are available in that online catalog, and many collections have finding aids online or at HSP that provide more information. Visitors to HSP's library should also look for names and other terms of interest in our manuscripts card catalog , known as PC1 (and not available online), which serves as a name index for many manuscript items. Collections from the Balch Institute for Ethnic Studies, which merged with HSP in 2002, are also described in this online manuscript guide . Note that some genealogy, immigration, and other types of records are now available online. HSP offers visitors to our library free access to AncestryInstitution.com ; FamilySearch.org  is free for all users. Check out Reading Room Databases  to learn more about the tools available to researchers in our library. You can also contact a Reference Librarian  for further assistance. HSP has a large number of published resources to help researchers looking into their Jewish roots. For a general overview on genealogy, check out HSP's "Family History & Genealogy " subject guide. You may also want to check out the National Archives' guide, "Genealogy: Ethnic Heritage ." Its section on Jewish resources  includes a variety of helpful genealogy resources. (0.4 linear feet) Mendel Boonin was born in Slutsk, Russia in 1887 and came to the United States from England in 1911, settling in Philadelphia. This collection includes Boonin family letters transcribed from Yiddish to English. (0.2 linear feet) Emily Solis-Cohen was a religious and secular educator and was active in Jewish and women's organizations in Philadelphia. The collection contains miscellaneous correspondence, clippings, poems, published articles, and memorabilia. (0.4 linear feet) Faigel Katz Silverman was born in Philadelphia. An actress on stage and radio, she gave recitations for community groups and events. The collection includes correspondence, programs, scripts, sheet music, uncatalogued photos, and a diary related to Silverman's career and the community activities of Mayer Katz. (3.75 linear feet) This collection consists of genealogical research conducted and compiled by Florence Kohn Abrahams, with a particular focus on genealogies of Jewish families. Families of note include Abrahams, Benjamin, Cohen, Moss, and Davis. Correspondence and compiled research comes from family members in Australia, Montreal and the United States. (1.6 linear feet) Jacob Solis-Cohen was a member of a prominent Philadelphia Sephardic Jewish family. He was a real estate appraiser with the real estate company Mastbaum Brothers and Fleisher, eventually serving as vice-president of the firm. He became president of Albert M. Greenfield and Company when that firm merged with Mastbaum Brothers and Fleisher in 1929. Solis-Cohen was also active in several Jewish organizations. He served as president of the Jewish Publication Society and of the Mikveh Israel Congregation and was a member of the boards of directors of the Foster Home for Hebrew Orphans and the Jewish Theological Seminary, and the executive council of the American Jewish Historical Society. The collection consists primarily of correspondence relating to genealogical matters and to Solis-Cohen's activities with the Foster Home for Hebrew Orphans and other charitable organizations. Also present are writings, chiefly on historical topics, and scrapbooks documenting Solis-Cohen's personal and business life and the genealogy of the Silva-Solis family and related families. A related group of photographs, Jacob Solis-Cohen Jr. photographs (collection PG061) , contains 36 items, including individual portraits, business and social events and miscellany. (15.0 linear feet) These records of the Philadelphia edition of Forverts include subscription and financial records, and materials concerning carriers and advertising balances. A related group of 25 photographs, Jewish Daily Forward photographs (collection PG040) , includes portraits of leaders of Jewish labor, community, and fraternal organizations, and group portraits and social events. (2.9 linear feet) Joseph Paull was a wholesale butcher, professional strongman, and an influential member of the Jewish community in Philadelphia. He was active in a variety of philanthropic organizations, especially the Uptown Home for the Aged. The collection contains biographical material, correspondence, clippings, and awards. A related group of photographs, Joseph Paull photographs (collection PG129) , includes 265 items, including portraits of Paull, friends and associates, family groups, prison activities, and miscellaneous events and philanthropies. (265 items) Cahn owned theaters and opera houses in the northeastern United States. This business correspondence concerns theater bookings and cancellations. (0.6 linear feet) The Labor Educational Centre was opened in 1934 as an educational and cultural center. It was the second such center founded by a number of Jewish left and labor organizations, including the Workmen's Circle-affiliated Arbeiter Ring and related groups. The Centre received subsidies from various Jewish organizations including the Allied Jewish Appeal. The collection includes blueprints and other documentation for the building, correspondence, and general administrative and financial records. (1 volume) This volume contains the minutes of Northern Chevra Kadisha in Philadelphia. (4.7 linear feet) Ossip Walinsky was born Joseph Melechinsky in Grodno, Lithuania in a Orthodox Jewish family. Following an arrest for anti-government activities in 1904, he escaped to Germany and then settled in London. In 1912 he immigrated to the United States and settled in New York City, where he became active as a labor organizer. In 1918 he became a manager of the Pocketbook Workers Union, New York, and remained with them until elected president of the International Leather Goods, Handbag, Belt, and Novelty Workers Union in 1951. Walinsky was also a prolific writer and was active in Jewish, Zionist and humanitarian organizations. The collection contains biographical material, correspondence and organizational records from the Pocketbook Workers Union and the International Leather Goods, Handbag, Belt, and Novelty Workers Union, and records from several Jewish organizations. Also included are clippings related to Jewish organizations. A related group of photographs, Ossip Walinsky photograph collection (collection PG125) , contains 112 items, including individual and group portraits from testimonial dinners and labor union meetings and events, and other unidentified groups. (0.2 linear feet) This Philadelphia women's service group was affiliated with the Knights of Pythias. The collection consists of financial records, including income and expense ledgers, and audit statements. (2.0 linear feet) Rose I. Bender was born in Philadelphia, the daughter of Joseph and Rachel Magil, Lithuanian immigrants and pioneer Zionists. She was active in Hadassah and a wide variety of other Jewish organizations at both the local and national level. In 1945 she became Executive Director of the Philadelphia Zionist Organization of America. The collection consists of correspondence, clippings, and miscellaneous items relating to Bender's activities in Hadassah, the Zionist Organization of America, Allied Jewish Appeal, and other organizations, including the National Jewish Hospital, American Palestine Music Association, and the Palestine Pavilion at the 1939 World's Fair in New York. Also included are notes and souvenirs from her work as a delegate at Zionist congresses in Geneva (1939) and Basel (1946). (0.2 linear feet) Jean Gornish, better known as Shaindele di Chazante, was born in Philadelphia. A liturgical singer, she performed Orthodox music in concert and on the radio. She was the first woman cantor, though she never served in a synagogue. The collection contains correspondence, clippings, posters and publicity and other printed materials. (13.2 linear feet) The Workmen's Circle, a national Jewish fraternal organization, was founded in 1892 by Russian Jewish immigrants. The first Philadelphia branch was probably chartered in 1904. The organization promoted the development and preservation of Yiddish culture in the United States, and its members were active in the labor movement. The Workmen's Circle was aligned with the Socialist Party for three decades, then increasingly supported liberal democratic policies and Jewish nationalism. The collection contains minutes, correspondence, financial records, and membership records of several organization departments which document the scope and stability of the Philadelphia district programs. Researchers may also be interested in a related group of 40 photographs, Workmen's Circle photographs (collection PG127) , and the Workmen's Circle Choir phonograph recordings (collection D0439) . HSP has microfilm and print copies of various periodicals focused on Jewish communities in Philadelphia, the Northeastern United States, and beyond. Some microfilm newpapers from the Balch Institute for Ethnic Studies have been digitized, and are available online for visitors to HSP's library at 1300 Locust Street, Philadelphia. Learn more about HSP's Reading Room Databases . Researchers may also be interested in consulting the Philadelphia Jewish Archives Center (PJAC) , which is now part of the Special Collections Research Center at Temple University .